Earlier this month, the New Partnership for Africa’s Development (NEPAD) agency published the Africa Nutrition Map. The map (Figure 1) provides a snapshot of Africa’s nutrition status at the end of 2016. The map displays “hot points,” places where hunger, malnutrition, and food security are critical issues. It also measures both the percentage of arable land and the prevalence of non-communicable diseases, such as obesity and diabetes. According to the map, adult obesity is prevalent at a rate of 15 percent or greater in 13 of 53 African countries. Stunting is prevalent at a rate of 30 percent or greater in 28 countries. Adult diabetes is prevalent at a rate of 10 percent or greater in 16 countries. Twelve of the 13 countries with high rates of adult obesity also have high rates of diabetes—a connection also established in medical literature. Interestingly, Botswana is the only African country with combinations of high rates of adult diabetes, adult obesity, and stunting. Further, the number of malnourished people ranges from 1 million to 20 million undernourished people per country, with the largest number of undernourished people concentrated in East African countries, such as Ethiopia and Tanzania (two of Africa’s most populous countries). 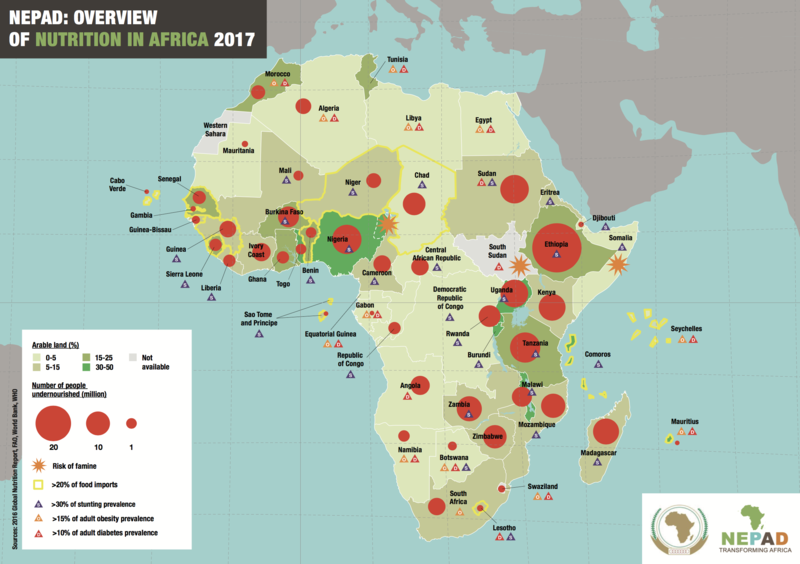 Notably, the map illustrates that despite holding half of the world’s arable land, Africa is disproportionately affected by hunger-related issues. While only 16 countries have between 0 and 5 percent of their land that is arable, nine African countries have between 30 and 50 percent of arable land. For example, arable land accounts for up to 48.7 percent and 46.7 percent of total land in Togo and Burundi, respectively. This is more than four times the 2014 worldwide average of 10.9 percent.